Scarface Claw is the most magnificent and feared tomcat in town. Storms, sirens, dogs and spiders, none of these things scare him. There is nothing, nothing at all that he is scared of, except…(I’m not telling). 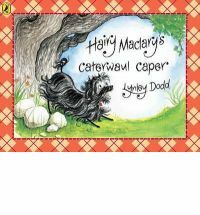 A story revolving around another popular Lynley Dodd character, (my daughter’s favourite). Simple rhyming sentences, with mostly a single sentence on each page make this another fun read to share with the very young. Scarface Claw is off doing his thing. 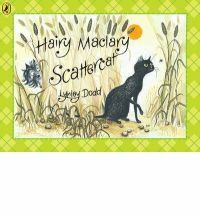 Hairy Maclary is enjoying his meal when he hears a strange sound. He isn’t the only one who’s day is interrupted. Hairy and his friends stop what they are doing to investigate the yowling and wailing. Another wonderful visit with Hairy and his friends. This one has more text than the original though it keeps with the simple language and use of rhyme. There is plenty of opportunity for interaction in the form of many and varied sound effects. I had great fun reading this to my girls when they were younger. 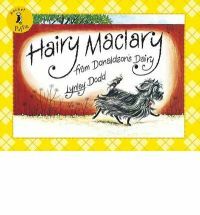 Hairy Maclary goes for a walk. Along the way his friends join him. That is until they scatter, yowling and howling. What on earth could have caused such a commotion? Wonderful popular and fun. Easily recognisable illustrations, with simple repetitive and rhyming text. 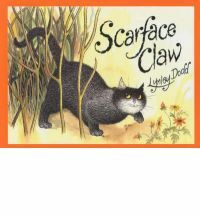 Children will very quickly know the story and if they are anything like mine they will love shouting out the name, Scarface Claw! This story has been around for a long time and is unlikely to fade away any time soon. Possibly best suited to younger readers (2-4) who have shorter attention spans.